This cake includes swiss dot design work on the cake side with handmade rolled white chocolate bible & rosary on top, in coordinated color. Pricing includes customer’s choice 1 color bible & design work. 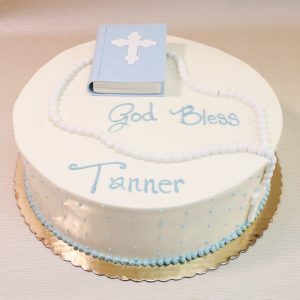 Shown as a 10″ round frosted in our vanilla buttercream with lightest cw blue detail & bible. Available in all flavors and sizes with at least 7 day’s notice.